Timing is everything and to perform at your highest level you need a carbohydrate fuel source that moves through the digestive tract as fast as possible. 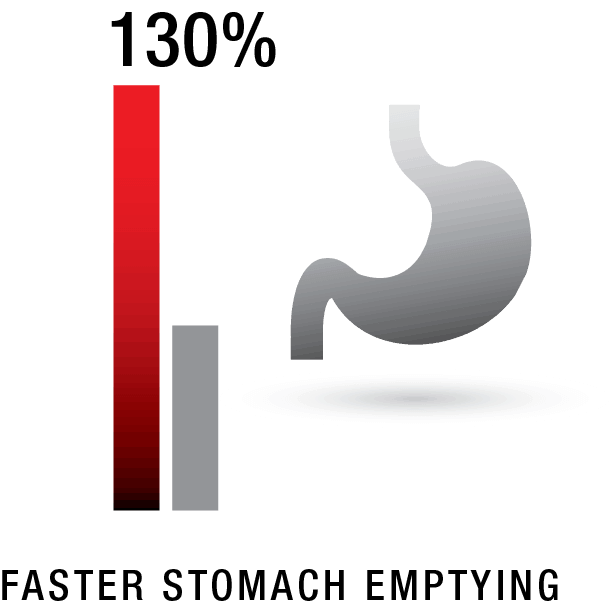 Instead of spending time in the stomach, Vitargo gets to where it’s needed, your “screaming muscles”, 2.3x faster than all other sports drinks. Many competitors tout “fast absorption”, but they are NOT as fast as Vitargo. You could never fuel, refuel and recover with food or any other sports product with the speed and comfort of Vitargo. Muscle glycogen recovery is fuller and faster for athletes using Vitargo. By repairing and refueling your depleted muscles immediately following your intense training session, you will take advantage of the highly publicized “anabolic window.” This brief window of opportunity is when your body will drastically absorb and utilize nutrients—much like a sponge to water— in order to build more muscle. Vitargo will replenish your depleted fuel reserves 70% faster than any other leading carbohydrate, leaving your muscles full, fed and fueled for your next workout. Vitargo led to nearly 77% higher and 70% faster muscle fuel recovery just 2 hours after exhaustive exercise, and in a separate study – higher power output and greater movement velocity, compared to maltodextrin. 10% to 23% more maximal endurance wins the race, the round, the game! Are you frustrated that you’re not able to achieve peak performance as an athlete? Most energy supplements make BIG claims but fail to deliver and that’s why Elite athletes and Olympians use our clean-carb supplement, Vitargo. Vitargo is their “secret weapon”. This is an energy supplement that can increase your performance by up to 23% compared to other sports drinks. Why settle for 2nd best? The research is clear, Vitargo is faster to fuel your performance so you can achieve your peak.